Who are the important environmental producers and cyclers of DMSP? Dimethylsulfoniopropionate (DMSP) is one of Earth’s most abundant organosulfur molecules. It is an anti-stress compound that is produced by marine phytoplankton and many marine bacteria. 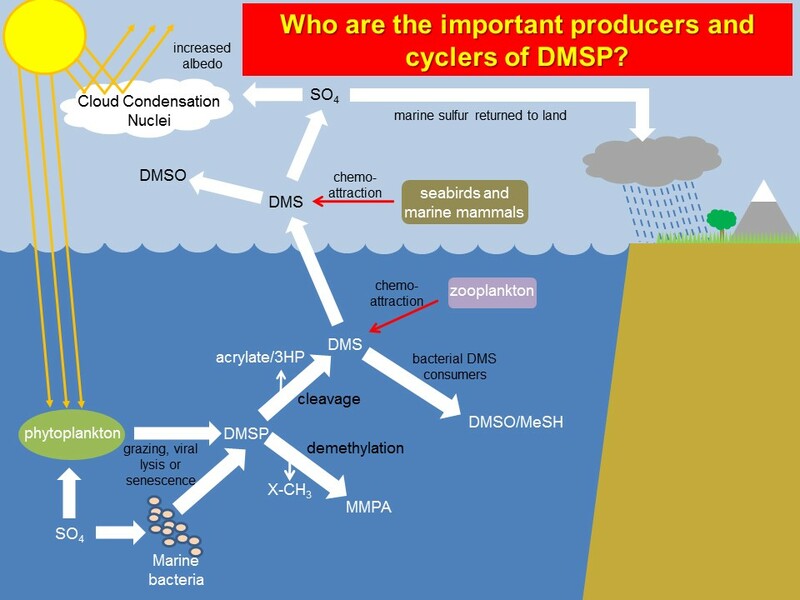 When released into the environment, DMSP has important roles in global nutrient and sulfur cycling, signaling pathways and in climate, since DMSP catabolism can generate the climate-active gas dimethylsulfide (DMS). There are few molecular-genetic studies into DMSP synthesis by any organism or environment. We recently identified the key genes involved in DMSP synthesis in bacteria and phytoplankton, thus are well placed to rectify this. This project will explore the role of microbes in DMSP cycling at a world-renowned sampling station in the English Channel using cutting edge molecular techniques. You will use traditional oceanographic sampling combined with molecular ecology techniques, including gene-probing, metagenomics and metatranscriptomics, to study microbial populations that produce and catabolise DMSP in surface ocean samples from the English Channel over six-month study. The expression and abundance of the key genes will be assayed by PCR-based techniques. DMS and DMSP will be analysed by chromatography and mass spectroscopy-based methods to quantify rates of DMSP synthesis and catabolism. You will combine geochemical and molecular approaches to identify key microbes that produce and catabolise DMSP, identify the key genes and cognate pathways that contribute to the flux of these influential molecules. Culture-dependent studies on model microbes that make DMSP will enable the investigation of conditions that affect DMSP production. This project will provide essential data to enable scientists to better understand key biotransformations in the global sulfur cycle. You will receive exceptional training in molecular ecology and microbiology, bioinformatics, analytical chemistry, ecosystem modelling and in writing publications and will give presentations at international conferences. You will undertake research at UEA and Plymouth Marine Laboratory, gaining experience of working on-board a research ship during coastal marine fieldwork. You will learn good laboratory practice, quality assurance, and receive health and safety training. We require a committed student keen to master a wide range of techniques on this multidisciplinary project, who has experience in some of the key components. Curson ARJ, Todd, JD, Sullivan MJ and Johnston AWB (2011). Catabolism of dimethylsulfoniopropionate: microorganisms, enzymes and genes. Nature Reviews Microbiology 9: 849-859. Curson ARJ, Liu J, Bermejo Martínez A, Green RT, Chan Y, Carrión O, Williams BT, Zhang SH, Yang GP, Page PCB, Zhang XH, Todd JD (2017). Dimethylsulphoniopropionate biosynthesis in marine bacteria and identification of the key gene in this process. Nature Microbiology. 2:17009. Curson ARJ, Williams BT, Pinchbeck BJ, Sims LP, Martínez AB, Rivera PPL, Kumaresan D, Mercadé E, Spurgin LG, Carrión O, Moxon S, Cattolico RA, Kuzhiumparambil U, Guagliardo P, Clode PL, Raina JB, Todd JD. (2018). DSYB catalyses the key step of dimethylsulfoniopropionate biosynthesis in many phytoplankton. Nature Microbiology. 4: 430-439. Archer, S.D., Kimmance, S.A., Stephens, J.A., Hopkins, F.E., et al., 2013. Contrasting responses of DMS and DMSP to ocean acidification in Arctic waters. Biogeosciences 10, 1893-1908. Todd JD, Rogers R, Li YG, Wexler M, Bond PL, Sun L, Curson AR, Malin G, Steinke M, Johnston AWB. (2007). Structural and regulatory genes required to make the gas dimethyl sulfide in bacteria. Science. 315: 666-9.